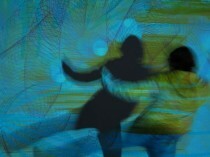 “passing by” is an interactive environment that allows the visitors to draw on a virtual screen with their bodies. Five activation points – “hotspots” – move randomly on the screen. By activating a hotspot the programm draws a geometrical form whereas each hotspot triggers a special form and each form is defined by the actual positions of the hotspots. As a consequence of all these relations (location of hotspots and interaction of visitors) every moment is different and unique.